TV show dates: October 2, 2017 — February 5, 2018. Performers include: Mark Feuerstein, David Walton, Elliott Gould, Linda Lavin, Liza Lapira, Matt Murray, and Albert Tsai. 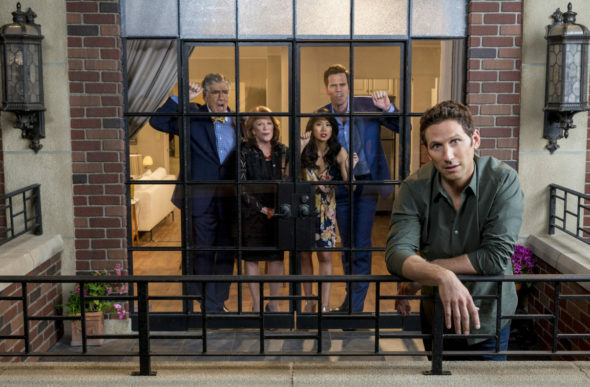 The 9JKL TV show is a sitcom from creators Dana Klein and Mark Feuerstein — a married couple — and is loosely inspired by the time they spent living next door to Feuerstein’s family, while he was working on his USA Network TV series, Royal Pains. While between jobs, newly divorced actor Josh Roberts (Feuerstein) moves from Los Angeles, back to his hometown of New York City. Josh’s parents, Harry (Gould) and Judy (Lavin), live on one side of his new digs. Meanwhile, Josh’s brother Andrew (Walton) and sister-in-law Eve (Lapira) live on the other. Josh is looking for time to collect himself and figure out his next steps. Living so squarely in the bosom of his family doesn’t exactly afford him the headspace and privacy he’s craving. Josh’s parents adore him. His mother, Judy, just has some trouble respecting the boundaries parents arguably ought to afford their adult offspring. For example, she pays off their doorman, Nick (Murray), to alert her to her son’s comings and goings. It’s not that Harry shares his wife’s lack of limits where Josh is concerned; this attorney and well-intentioned father doesn’t recognize boundaries in any aspect of life. Josh’s return inspires Harry to use his “connections” to land his son his next big gig. Meanwhile, despite his career as a successful surgeon, Andrew has never lost the urge to compete with his brother. Because he has no problem putting his parents in their place, he’s not above mocking Josh’s nest-adjacent return. Andrew is married to Eve, a pediatrician with a Harvard University pedigree. Rounding out the cast of characters is Ian (Tsai). This 12-year-old neighbor lives in apartment 5A, and the building lobby is his regular hangout. Surrounded, as he is, it is clear Josh needs to learn how to establish some ground rules and then find a way to get his family to abide by them. Still, they truly love him and will always be his staunchest allies. What do you think? Do you like the 9JKL TV series? Should this CBS TV show have been cancelled or renewed for season two? More about: 9JKL, 9JKL: canceled or renewed?, 9JKL: ratings, CBS TV shows: canceled or renewed? How I Met Your Mother: What Does Alyson Hannigan Think of the Last Episode? Cute in a sorta stupid way..
A lot better than a lot of the rubbish on there. I liked it.